The TIP SA office will be closed until 01 February 2016. Arrangements for a major review of the dental and allied health services provided to veterans have been announced. "The review will assess currently available services in relation to the current and future needs of veterans, as well as considering contemporary trends in the delivery of dental and allied health services in Australia." From Friday, 25 December to Monday, 4 January all DVA offices will be closed and DVA staff will not be available by phone, email, or social media. However, please be aware that the @Veterans and Veterans Families Counselling Service (VVCS) will be available 24/7 throughout this period on 1800 011 046. VVCS offers support to veterans of all conflicts, and their families. This service is free, and completely confidential. You can also get in touch through their Facebook page. In addition to the support offered by VVCS, standard services such as hospital admissions, transport bookings and pension payments will continue during this time. This seminar will provide a presentation on moral injury within the Australian military context and afterwards ex-military veterans can volunteer, if they wish, to fill in an anonymous military moral injury questionnaire to contribute to benchmark empirical research. It is likely that moral injury is one of the key reasons for the increased number of suicides within our military veteran community because of its possible relationship to PTSD. An ancient concept, ‘moral injury’ has only been empirically studied recently in the United States. This study and your involvement will be a first for Australia. Moral injury is an experience caused when a person either witnesses, unable to prevent, or causes an event that upsets their moral belief of what is right from wrong. Examples are betrayal (by peers or leaders in the chain of command), witnessing, causing, or unable to prevent, the injury or death of fellow service members or civilians. This seminar is focused on moral injury among Australian ex-military veterans and it intends to begin the discussion about moral injury within the Australian context. It also intends to establish an empirical benchmark about the extent of moral injury within our military veteran community and its possible affects. As an ex-military veteran your help is needed. If you require a carer at the seminar, they are more than welcome to attend. The Aged Rights Advocacy Service (ARAS), in conjunction with other member agencies of the ‘Alliance for the Prevention of Elder Abuse’ (APEA), has developed new Fact Sheets covering information regarding Enduring Power of Attorney and Advanced Care Directives. The latest issue of the Men's Health Peer Education Magazine is now available on online. The theme for this issue is 'The Family'. 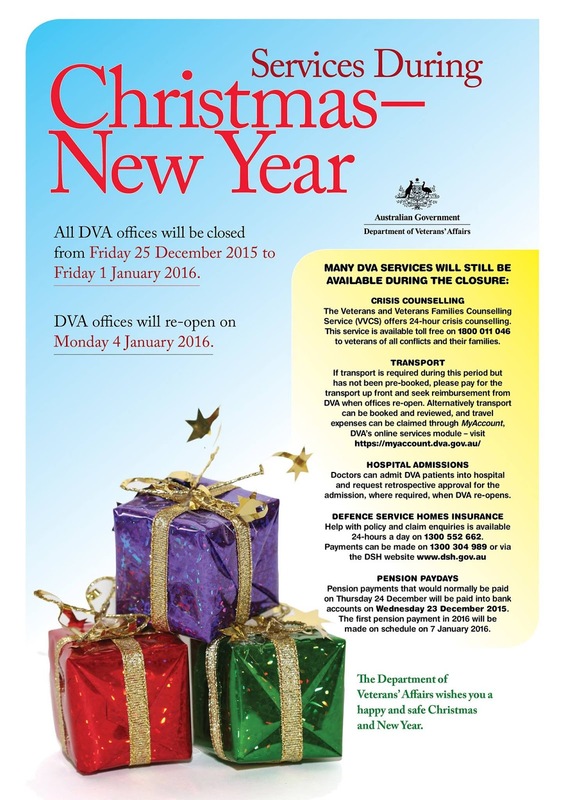 DVA will have a reduced services period from Friday, 25 December to Monday, 4 January. During this time all DVA offices will be closed, and DVA staff will not be available by phone, email, or social media. - The Veterans and Veterans Families Counselling Service (VVCS) offers 24/7 crisis counselling, available for free on 1800 011 046 to veterans of all conflicts and their families. - Transport can be booked and reviewed through MyAccount –https://myaccount.dva.gov.au/ If you do not use MyAccount and require transport during this period, you can seek reimbursement once DVA offices reopen. - Doctors can admit DVA patients into hospital and request retrospective approval for admission, where required, when DVA re-opens. - Defence Service Homes Insurance support is available 24/7 on 1300 552 662. Payments can be made on 1300 304 989 or via the DSH websitewww.dsh.gov.au. - Pension payments that would normally be paid on Thursday, 24 December will be paid into bank accounts on Wednesday, 23 December 2015. The first pension payment in 2016 will be made on schedule on 7 January 2016.